Dear Miss Bella (aka. Mrs Van Nistelrooy) is always complaining about how my blog taunts her with photos of food in Malaysia which she misses and can't have (since she is in Australia now). Q: So, what does she do? A: TAKE REVENGE by writing a wonderful post on delicious food in Australia that I can't have because I'm in Malaysia! 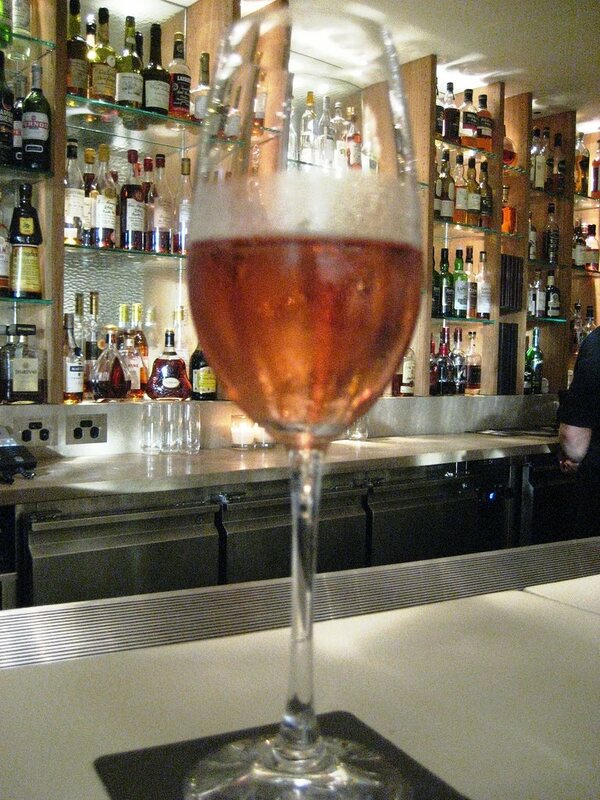 With the resources boom in the oft-overlooked state of Western Australia seeming to have no end in sight, Perry had observed a change in the tastes, dining preferences, and importantly, wallet sizes of its citizens - Partnering with Crown-owned Burswood Resorts and Casino, Perry opened his third Rockpool restaurant in the Southern Hemisphere. I have not had the opportunity to dine at Rockpool Sydney, however my dining companion has, and he was very enthusiastic about trying out Rockpool Perth. We arrived about 20 minutes earlier than our booking time, and we were ushered to the bar to have a drink while they readied our table. 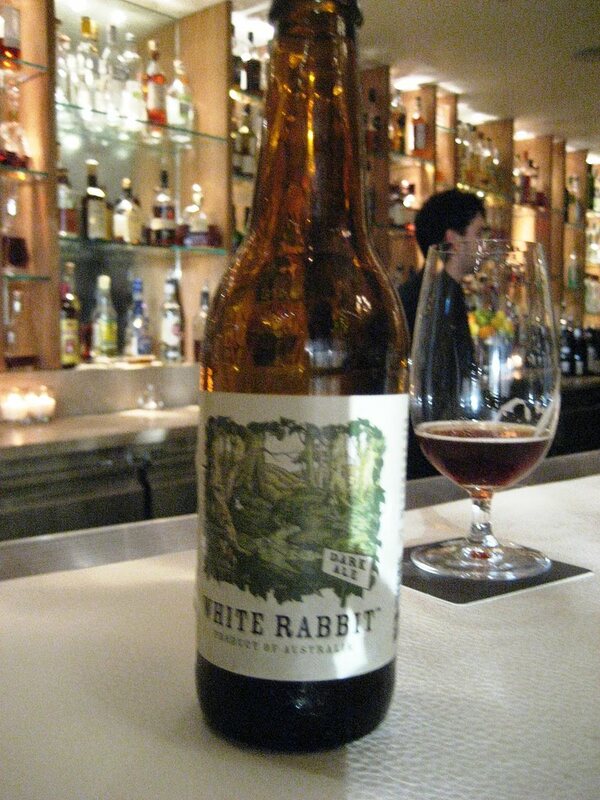 I started with a 2009 Honey Moon Vineyard ‘Brut Rosé’ sparkling wine and my dining companion a White Rabbit, a dark, robust ale. At 6.30pm, we were ushered to our table by our maitre d'.... For the sake of this review I will call him Jean-Luc - he had a French accent and the more I called upon his expertise to explain the menu to me in plain English, the more I actually addressed him as so, even though I had no idea what his name was. Before I dive into the food, I apologise for the poor quality of the photos – point and shoot camera are terrible in dim lighting. First off – a side of bread and butter. 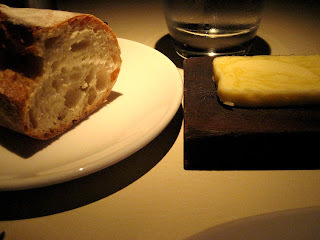 The bread was warm, fresh and chewy, the butter not too salty. I did like the bread, but I felt it was something I could easily get from the New Norcia Bakery. We started with the Ceviche of Prawn and Red Emperor with Avocado and Cherry Tomatoes (AUD $ 32++). Jean-Luc had warned that the ceviche had chillis which can be rather spicy. The ceviche was delicious, a great opener to our meal. The raw prawns and red emperor were soaked in lemon juice for just the right amount of time, and it was bouncy with a bit of chewiness to it. 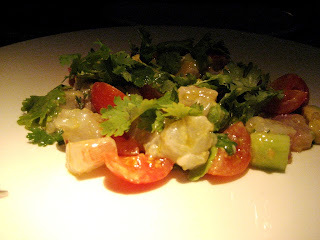 The avocado and cherry tomatoes were a fresh addition to the prawns, and the parsley gave a really nice herby kick to it. As for the chillis? Not even close to spicy, but it did lend a sort of sweetness to the dish. A very refreshing starter. Our second starter was the Duck and Walnut Galantine with Spiced Orange Marmalade and Toast (AUD $ 20++). Compared to the ceviche, this was very rich. 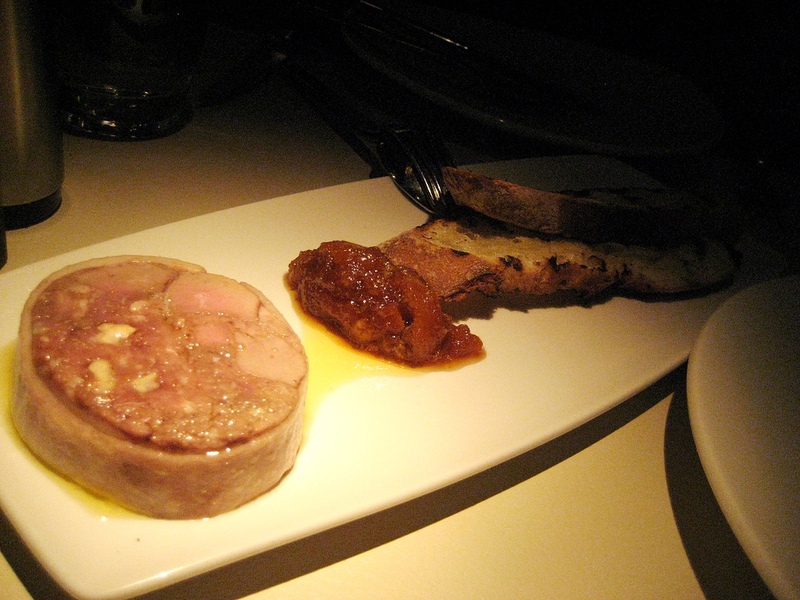 The gallantine was delicious, with walnuts dotted throughout the dark meat. The gallantine with the marmalade, which had a slightly burnt aftertaste to it (a good thing! ), creates a fantastic taste explosion. 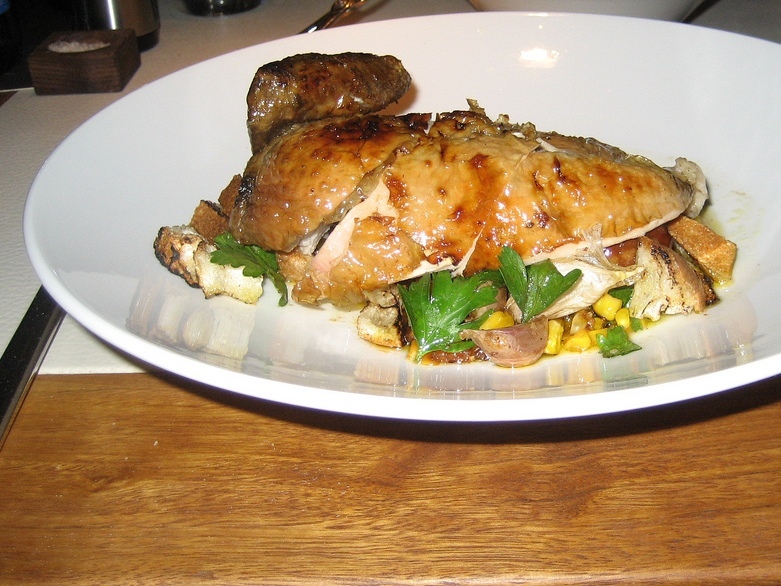 After much argument, I ordered the Mount Barker Free Range Chicken, Char Grilled Corn, Pumpkin, Roasted Garlic and Bread Salad (AUD $ 39++). My dining companion complained that my dish was going to take 50 minutes (as warned on the menu), and he’d be dead from starvation by then. Still, our starters kept us filled while waiting. Free range organic chicken definitely tastes very different from normal chicken. It was soft and almost had a velvety quality to it, with the skin melting in some parts but deliciously crispy in others. I really enjoyed this dish, and the sweet grilled corn it came with provided a good counter to the savoury chicken. My dining companion had the Wood Fired Grilled David Hohnen’s Arkady Lamb Loin Chops and Cutlets with Mint Jelly (AUD $ 38++). Don’t be fooled by the picture, you can actually add ‘sides’ to this dish. We argued about this as well, considering the starters we ordered. 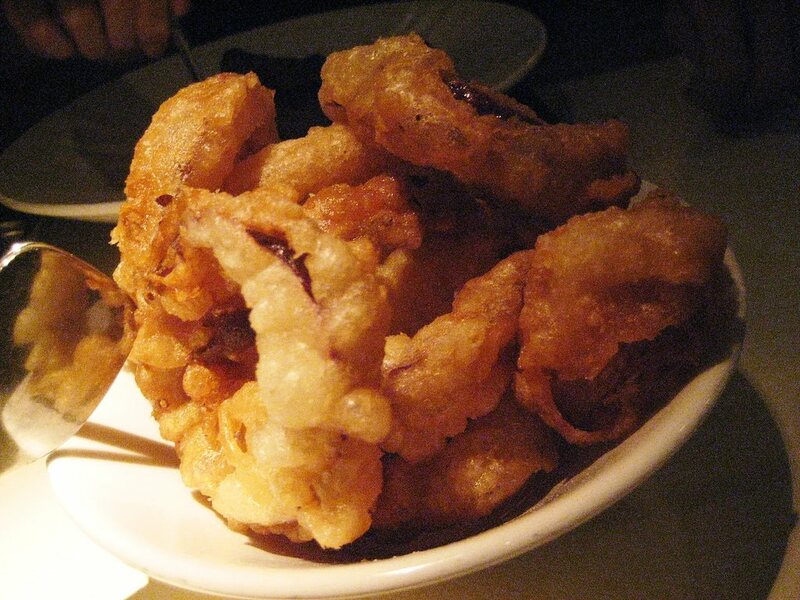 He wanted Hand Cut Fat Chips AND Onion Rings, but I said that was going to be too much, so he settled for Onion Rings. 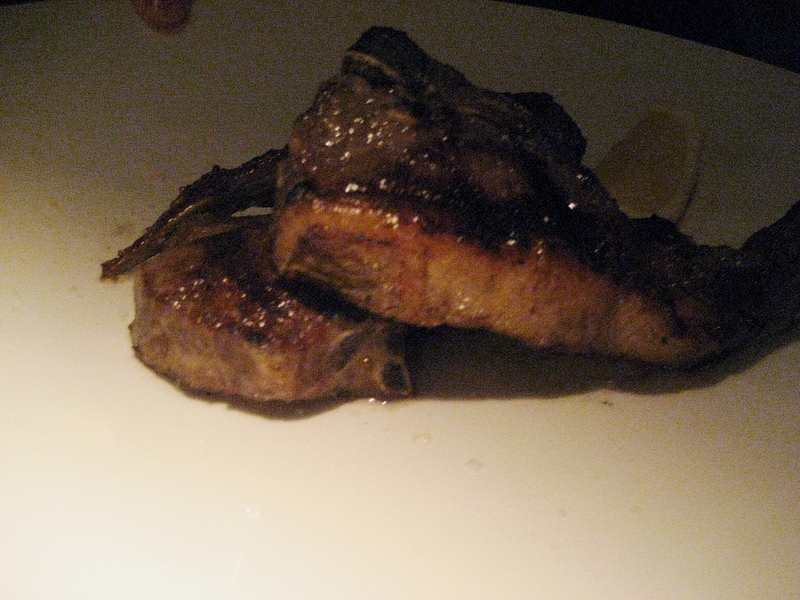 The lamb was nicely cooked, grilled brown on the outside and still pink on the inside - the meat melts in your mouth. The mint jelly was nothing like the stuff you buy in a bottle from the supermarket. You could practically smell the fresh mint like it was just plucked from the plant - Loved it. The onion rings were a little bit hit and miss. I’m not sure whether they sprinkled salt over it, but the first one I had was very salty. Having said that though, the rings were coated in a delightful light batter, and it definitely went well with the lamb (and chicken!). By the time our mains were taken away we were full to bursting. We still asked Jean-Luc for the dessert menu though. There is always room for dessert, especially at Rockpool. My first trip to Rockpool had been for dessert. While my colleagues ordered ‘healthier’ items like a cheese platter to share, I went rogue and ordered the Profiteroles and Ice Cream with Chocolate (AUD $ 16++). I did not regret it and have been dreaming of it since, so I zeroed in on this dessert once again. Jean-Luc advised that the ice cream this time was caramel. It was just as I remembered. Profiteroles topped with hardened chocolate, nuts and crunchy crystallized sugar, with caramel ice cream sandwiched between. I was back in heaven. It’s the kind of dessert that has a little bit of everything to make you completely satisfied – pastry, chocolate and caramel. No other dessert will ever come close to this. For now, anyway. Jean-Luc recommended the 2009 Xanadu ‘Cane Cut’ Semillion Savignon Blanc (Margaret River) dessert wine to go with the profiteroles. This wine was warm, rich, and robust, with fruity undertones that went very well with my profiteroles. As for my dining companion, he went for a favourite as well, the Peanut, Caramel Chocolate Tart with Milk Ice Cream (AUD $ 23++). 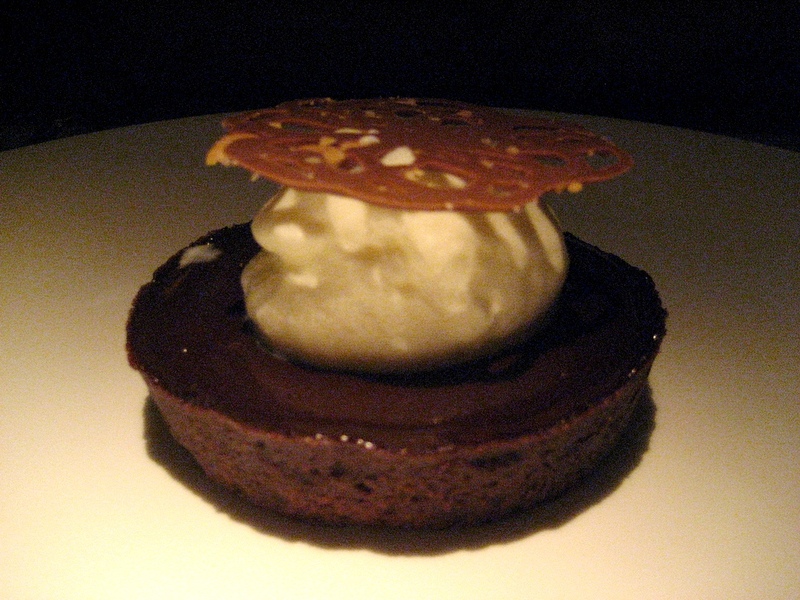 The tart was outstanding – it's very hard to find well-made chocolate tart anywhere, and I have to say, this was a very good chocolate tart, with the mix of chocolate, peanuts and caramel, along with the house-made vanilla ice-cream. Ooooh, popcorn to go with coffee! Yum! My initial reservations with ‘fine dining’ is that I’d end up having to drive through McDonald’s after. 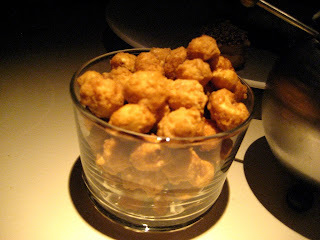 However, Rockpool is surprisingly generous with portions, so my reservations were completely unfounded. Overall I’d say the Rockpool dining experience was good, with attentive, knowledgeable staff, both at the front line and in the open kitchen, an extensive wine list, and a rich, earthy restaurant décor. The funny thing is, after you’ve had a lot to eat, you tend to feel a little bit guilty. I didn’t feel it one bit, in this case. Perhaps Perry’s idea of fresh produce and good cooking makes it a less guilty experience? Who knows? It’s definitely good cooking, though. when i was in brisbane i was jealous of people in perth, in addition to rockpool, they also have nobu. im like hey isnt perth as big as brisbane? anyways since im back in melbourne, theres nothing much to envy but i do need to go make a reservation to try this place out, heard about the beef and the enormous price tags! Thanks. Me & husband been planning to go Rockpool when in Perth this May. Sounds delicious but prices looks scary though. should probably add to those intending to dine at Rockpool... bookings are a MUST. Anyway, yeah the prices look really scary but hope you n ur hubby enjoy it a lot. Oh oh oh, they are just too delicious to bite!!! 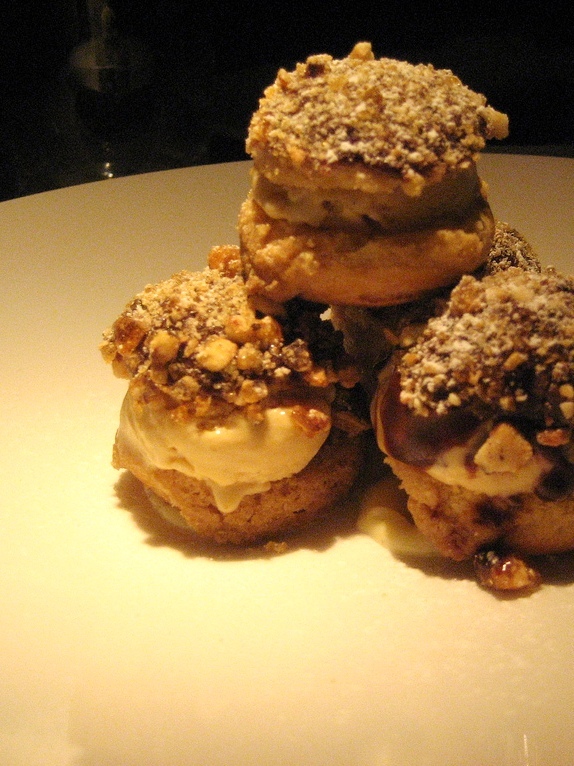 A stack of delicious profiteroles is always the perfect end of one gorgeous dinner. These are irresistible. The best way to enjoy a simple and spoiled birthday with the only presense of the closest friends is to be at some special culinary place like this- nice music, exquisite food and elegant atmosphere.